4 Eye lid oedema in association with erythema and telangiectasia is a common feature of dermatomyositis. It may be the symbol of hypomyopathic or amyopathic dermatomyositis with a poor prognosis. Increased ferritin predicts development and severity of acute interstitial lung disease as a complication of dermatomyositis. Increased expression of the NOD-like receptor family, pyrin domain containing 3 inflammasome in dermatomyositis and polymyositis is a potential contributor to their pathogenesis. The prevalence of ILD is higher in patients with CADM than in those with classic dermatomyositis or polymyositis. Update on the treatment of calcinosis in dermatomyositis. Based on these clinical findings, dermatomyositis was suspected. To our knowledge, enteroviral infection has not previously been associated with rituximab use in patients who also had hepatitis, dermatomyositis, and edema, as in the cases we report and those associated with XLA (5). In the case of a severe flare of dermatomyositis, 1 g per day for three days of methylprednisolone intravenous pulses can be administered. 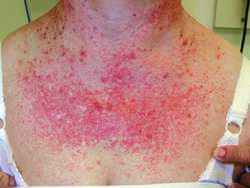 The patient was never diagnosed or treated with dermatomyositis prior to this evaluation. Dermatomyositis (DM) is described as both a progressive primary inflammatory myopathy and an idiopathic microangiopathic disorder.